Supercamp is a geared for BMX racers of all ages and abilities to get stronger, gain confidence, speed and faster gates. Time: 9 AM-3 PM (times may change). Watch Facebook and this CochraneBMX.com for more information about SuperCamp! Time: Under 10 - 9 AM-12 PM (times may change). Time: Over 10 - 1 PM - 4PM (times may change). 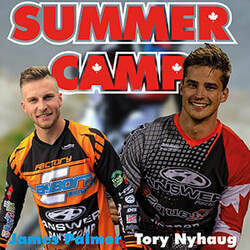 Watch Facebook and this CochraneBMX.com for more information about Nyhaug & Palmer SUMMER CAMP! Interested in joining the Cochrane BMX Association for the 2019 BMX season? Cochrane BMX Association registration fees are $80 for the 2019 season.